OK so we know that flourescent bulbs are "greener"�but have you looked at your reflection under a flourescent bulb? Hmmm�so enter our Vintage Antique Filament Bulbs and look fabulous all the time! These bulbs are known for their soft glow and ambient light. The super-cool look of these bulbs is just the icing on the cake. You look amazing, the lights look amazing, it's really a win-win. You can put them in a light fixture OR simply hang them from an electrical cord with a socket. 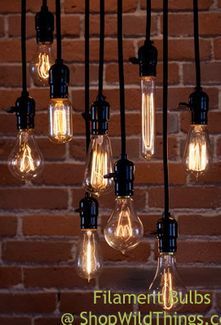 Here at ShopWildThings we carry a ton of awesome lighting that would look amazing with an Antique Bulb inside. It's so easy to be cool when you're hanging out with us. Bundle 15 Lights Pendant Lamp "Akira"